Fire Siege Fortress is NetEnt software based online video slot game for which reels are 5 and Paylines are 576. Total coins for the game is 20. You can play this latest video slot using any of your devices including mobile phones, smart phones, tablets or desktop for coin sizes of 20p per spin to up to £€200 per spin. The game will offer you a jackpot of 120 times on your total stake and there are a huge number of bonus features (6) available in this game. You can receive up to 18 free spins. Fire Siege Fortress is based on a medieval theme and is being set against a castle/fortress where you would find symbols like A, Q, K, J and 10 paying cards as well as swords, axes and hammers. The game comes with Fire Free Spins feature, Fire Siege Free Spins feature, 3 different wild windows as well as Tower Coin Win feature. The game also features a valiant knight and a dragon who breathes fire. 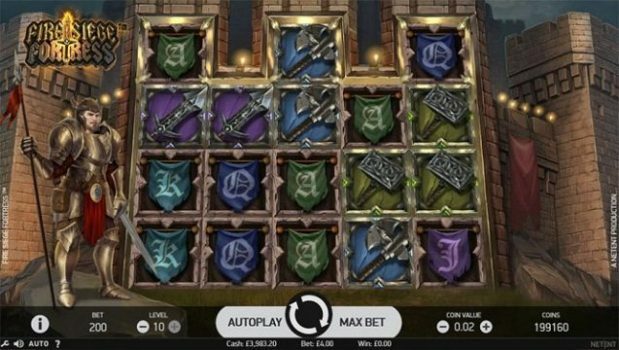 The dragon is the most lucrative and highest paying symbol in the game which would give you 2,3 and 5 times of your total bet, if appearing 3,4 or 5 symbols across a payline. The wild windows will be triggered during the base game and there are 3 wild windows exist in the game. Each of these wild symbols can be activated only once at a time on a spin or all of them can also be triggered/activated at a same time with same spin. The first feature is Archer Attack feature:– This feature is triggered when a wild symbol lands on the bottom of the reel 2 and in that case 1 to 3 random wilds will be added to the reels. The second feature is Dragon’s Breath feature:- This feature gets activated when the wild symbols lands on bottom of the reel 3 and then the expanding wild will turn all symbols on that reel to wild making it a wild reel. The game also comes in with Trebuchet Assault feature: – When a wild symbol lands on the bottom of reel 4, this feature gets activated. During the activated of this feature a Giant wild symbol will randomly appear on the reels. Fire Siege Fortress slot has some bonus feature as well. The first is when the crown scatter symbols appears anywhere on reel 1, 3 or 5 then it will trigger Fire Siege Free Spins feature. This feature will get you up to 18 free spins. It is a very interesting slot game which is playable at all devices. You can play Fire Siege Fortress slot at any of NetEnt online casino real money site.